Bank of America had a strong fourth quarter, but there's one thing that really stood out. Bank of America (NYSE:BAC) reported fourth-quarter earnings that beat analysts' expectations, although the bank's revenue fell a bit short of what the market was looking for. There are plenty of reasons for investors to be happy with the bank's performance -- for example, the charge-off ratio sank to a historic low, expenses are down, and although they're not quite where they need to be, the bank's return on equity and return on assets are starting to look more respectable. However, there's one piece of information from the bank's earnings report you should pay close attention to. I've written before about how aggressively Bank of America has been buying back stock in recent years, and it makes perfect sense. 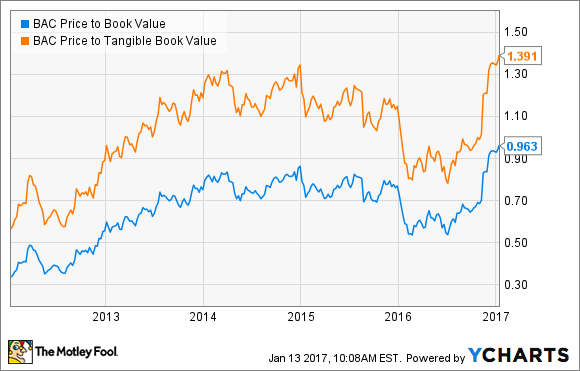 For the past several years, the bank has traded for a massive discount to its book value, and it has even traded for less than the value of its tangible assets at times. In fact, in 2016 alone, the bank repurchased $5.1 billion worth of its own stock. Since the bank's outstanding share count has fallen by approximately 330 million shares since the end of 2015, this implies that the average price of the shares bought back was about $15.45. Well, the bank just announced that it is increasing its buyback plans for the first half of 2017 by more than 70%, from $2.5 billion to $4.3 billion. This may seem surprising, especially because the current share price is nearly 50% higher than what the bank spent on its own shares last year. To be fair, the increased buyback won't purchase too many more shares than last year's thanks to the higher share price, but the dollar amount alone is impressive. 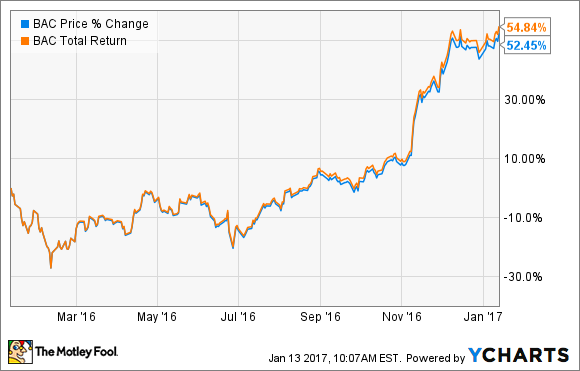 Over the past year, Bank of America's stock price has soared by 49%. When you include dividends, we're talking about a 51% total return for the bank's shareholders -- an amazing performance for one year. However, if you take a closer look at this chart, you'll notice that the vast majority of the gains came over the past two months -- specifically, after Donald Trump was elected to be the next president of the United States. Trump's planned tax cuts and other pro-economic-growth policies may translate into a significant rise in interest rates. Bank of America has previously said that a 100-basis point rise in interest rates (an additional 1%) would translate to an additional $5.3 billion in net interest income. My colleague John Maxfield recently published an excellent discussion on why higher interest rates will benefit Bank of America more than other banks. Trump has pledged to roll back regulations, such as Dodd-Frank. Not only do regulations like this come with significant compliance expenses for the banks, but relaxing these regulations would generally make it easier for the banks to do business. If Trump is successful in creating wage and job growth, as he claims, it would translate into more deposits for the bank, and likely lead to more demand for loans and other banking products. In a nutshell, Bank of America dedicating nearly $2 billion more than it had planned to buybacks over the next six months sends a clear message that management still believes the stock is a great value, and a smart use of capital, even after the big rally. To sum it up, the situation for American banks has changed, and with increased potential for rising interest rates, lower regulation, and more lending business to be had, the rally in Bank of America's stock could still be in the early stages.